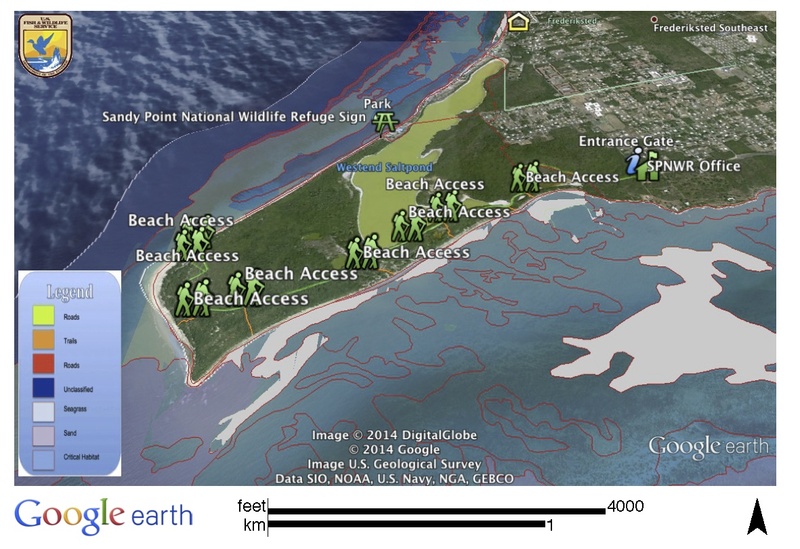 For a class assignment, I created a Google Earth map of Sandy Point National Wildlife Refuge. Printed output from Google Earth view of Sandy Point National Wildlife Refuge. <https://sites.google.com/site/mountainsol/Home/SPNWR-SW.kml>. (Really I should have uploaded it as a a KMZ). There is more detail in the Google Earth File, but unfortunately, WordPress does not allow an embedded KML viewer, found at <http://dl.google.com/developers/maps/embedkmlgadget.xml> and discussed in detail by Google Earth Outreach. However, it’s possible to embed a Google map on my Wordpress open notebook / portfolio. For an interactive map on this site, allow an embedded map from “My Maps” on Google Maps Engine Lite (albeit with the limitation of 4 KML layers). I really should include metadata, however for a short run down, I used the critical habitat boundary from the National Marine Fisheries Service to clip the GIS data for the Fish and Wildlife Service boundaries dataset (someone at FWS was lazy and just digitized a polygon around the water – the FWS is responsible for nesting habitat management to the waterline; NOAA/NMFS is responsible for the breeding habitat designated by the critical habitat designation). I also added the official FWS roads shapefile, because Google has incorrect information. In essence, all this data is official data, but the SPWNR boundary modified by me as described. It should go without saying this is for educational purposes only, and official GIS data should be sought from the source (FWS, NMFS). Thank you for registering for today’s InformationWeek live radio show at 3 p.m. ET: Naturally Social: An Interview with Dan Ashe of the U.S. Fish & Wildlife Service. We look forward to having you join us at 3 p.m. ET for our live on-air radio show and post-show community text chat. I’m doing a paper on the “State of the Art” of services, feeds, and widgets, particularly Geographic Information. Sent out a few tweets to see if I can track that down!